Lunch With Charles marked the debut of writer/director Michael Parker but it was also the first Hong Kong/Canada production ever. We have seen the Hong Kong studio Shaw Brother's collaborate with Britain's Hammer Studio but this is as far away from Legend Of The 7 Golden Vampires as you can get. 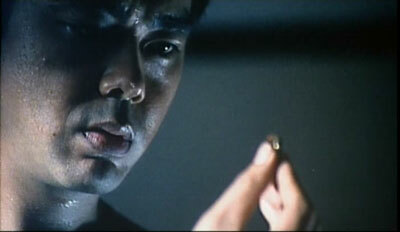 Tong (Lau Ching Wan from La Brassiere, billed as Sean Lau here) receives a bomb in his mail of the more emotional kind. It's his wife April's (Teresa Lee from Big Bullet) wedding ring. She lives and works in Canada and have for the last three years wanted Tong to come and settle down with her. He has not been willing to completely quite his aspiring musical career and now April has decided she don't want to wait no more. He now realizes how serious this is and boards the next plane to Vancouver in order to perhaps save his marriage. He's too late however since she has begin driving to the town of Banff where her advertising agency is arranging a concert in association with a beer company. Tong now has to get himself and his bare grasp of English to Banff. Got all that? Michael Parker's romantic comedy only seems difficult to follow on paper so don't worry. Lunch With Charles follows a straight and recognizable formula that wouldn't have stood out as much if it was set in Hong Kong or America for that matter. We don't get a new take on the rom/com-genre but the movie is greatly enhanced by its Canadian setting and scenery. Michael chooses story instead of visual flare and the only time the camera draws attention to itself is during the road trip where magnificent views of Canada and its landscape is on display. It's the photography that makes Lunch With Charles so much more noticeable than other romantic comedies. The script breaks no new ground but manages to throw in some points when it comes to the culture clash between the Westerners and the Hong Kong people. Interestingly enough it seems that the Hong Kong people are those that gets the most frustrated when dealing with the, as they call them, gwailos. Whether or not that is a true or exaggerated critique of the Hong Kong people I honestly can't say but Michael never turns the issue into one where the movie chooses sides. You've probably guessed that with a character in a foreign country and poor language skills, the fish out of water-gags are not far away. It's set up that Tong has resisted the idea of emigrating but now suddenly has to confront the country head on. It's a new land, new language and also to some extent, a new culture for him. What makes these different situations with Tong, not knowing anything or the language, funny is the fact that he thinks he's doing and saying things correct enough. His surroundings react but make little noise about it which, to me, seems more real and accurate. In other movies, the character would've ended up beaten or in trouble so kudos to Michael for going against the clichés. The second half of the movie lays low when it comes to the humour and concentrates more on the emotional aspects of the bonding between the couples. Dialogue is simple but still snappy in parts without coming off as cool. That fits certain movies but not this one. The music by Simon Kendall draws its inspiration from Ireland (the band featured in the movie plays Irish flavoured music) and is beautiful and well integrated. Even Lau Ching Wan gets to sing with Bif Naked on the track that rolls over the end credits that combines Tong's canto-pop influenced music with the Irish sound. Lunch With Charles came out quietly and I just happened to bump into it while browsing Lau Ching Wan's filmography. I don't think you could say that this is an attempt by him to break into the international market (it's just a small film) but he does prove that he can be as good in an English speaking part as he is when acting in his native tongue. His English is very good and even if they have dumbed it down for the sake of character, it's miles ahead of the delivery by Andy Lau and Simon Yam in Fulltime Killer for example. Here the emotions needed to be conveyed in English gets through and that sure didn't happen in the above mentioned movie. Neither he or any other actor have complex character arcs but since the movie doesn't aim that high, the characters are kept simple. We get a back story to Tong and through the writing and acting, his development is very accessible throughout. The majority of Lau Ching Wan's scenes are with Bif Naked (a singer in real life) and they work well together as two people who are from different worlds both on film and reality. As Natasha, Bif displays more of a wildflower aspect and a view on life that is more of the liberated kind. Through their bonding they both learn from each other and the movie doesn't have to offer any more deep meaning, between the two, than that. Teresa Lee annoyed the hell out of me in Big Bullet but thankfully displays very little of the goofiness in her role as April. She fits the character well and shows an acting style that suits her more I think. April is a career woman that has become very alone and forgotten about the beauty of life without someone by her side over the years. Matthew is the one that makes her smile again and again this pair also learns about each other and themselves over the course of the movie. 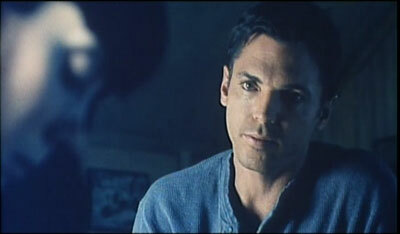 Nicholas Lea has a face and presence that is more suiting for tough guy-characters, as proven through his role in The X-Files and in the John Woo produced (but short-lived) series Once A Thief. His character has built up some frustration since he senses his marriage is falling apart and while Nicholas still delivers his some of his lines in tough guy-mode, it's still a compelling and gentler side of him we see in this movie. Nicholas also acted as the executive producer on the film. At the end of the film, the characters have all made a critical choice and Michael Parker's choices are going to be questioned. It's still his choices and we have to accept that. For me it didn't fully feel like the right choice but that has more to do with the fact that it was unexpected. You tend to expect a Hollywood feel to the end of certain movies but Canadian cinema doesn't seem to want to rehash old tired clichés. Also I have to say that the main characters only meet through one hell of a coincidence but you buy it for the moment and move on. Such things can destroy a movie for me but this one didn't. Michael Parker's Lunch With Charles is a pleasant and sweet little romantic tale. It does not make a huge impact but what it does have is a great performance by Lau Ching Wan and a look at a country rarely seen in movies. 2006 edit: As described below, there is more to Parker's vision and thankfully since then a Japanese uncut dvd has been issued, carrying imbedded English subtitles for the various scenes of Cantonese dialogue. More importantly, it becomes greatly clear that the Hong Kong print didn't want much to do with the road trip part of the film. Extensions and additions can be found before this latter section but what the uncut version in a welcome way expands on are Nicholas Lea and Bif Naked's characters. Even more wild, new age and nature bound than in the shorter edit, several scenes going over their past are available in the 110 minute edit. Scenes needed to understand the switches in Lau Ching Wan and Teresa Lee's characters and thus, the purpose of all characters take on more fleshed out meaning. If you're a fan of the film in its shortened form, I highly recommend you to swallow the high price tag of the Japanese disc in order to finally get the director's vision, fully. Buy the dvd at cdjapan. John Charles of Hong Kong Digital pointed out to me that this Hong Kong print is considerably shorter than the Canadian cinema print. According to The Ontario Censor Board database the Canadian print runs 110 minutes while this HK dvd only runs 94 minutes. 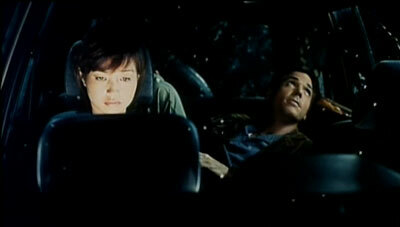 Widesight presents the movie in its original 1.85.1 aspect ratio. The picture is at times way too sharp (resulting in edge enhancement) and bright but overall looks ok. Print damage is not high but it's very noticeable when it does happen. If you choose the Cantonese Dolby Digital 5.1 track you get a track with a mixture of Cantonese and English. The latter is the movie's predominant language and Cantonese is used only sparingly. I didn't detect any surround usage and the front stage didn't impress me with it's minimal separation. At the 55 minute mark the sound level changes and becomes a bit too loud and poorly mixed. I had to turn up the center channel a few notches to get the dialogue properly centered at this point. The Mandarin 5.1 track is all dubbed into mandarin. The subtitles are burned into the print and translates all dialogue including the English. In the beginning it's a distraction to listen to dialogue you do understand and having subtitles at the same time. However you tend not to notice it as much as the movie goes on. There's a few instances of white on white but only during the English dialogue so nothing is lost. When needed they are very readable though. There are no extras on the disc besides a menu option with the plot synopsis in Chinese.